My way of giving thanks – a cake. Creating something almost too pretty to eat. But when you do it is so miracolous and lets you smile and blossom too. But to whom am I giving thanks? It is you reading these sentences right now. All of you who are sharing, reading, following and commenting. I am jumping for joy every time someone compliments my work, either in person or over the world wide web. It feels good to know that someone is actually reading or just looking through it. And when I can inspire you to get into the kitchen and try something new, I know that it was all worth it. I put so much love and passion in this blog and I hope to take it onto a whole new level. And guess what? You make it happen! Well, the eye catcher really are the edible flowers. But there are a few other amazing ingredients – like raspberries, ground buckwheat and fresh blackberries. The dough has a thick pancake like consistency and is really sweet on its own, but paired with the unsweetened tart flavour of the raspberries it is ideal. The gratitude does not end here – how crazy phenomenal is it, to be able to eat such delicious beauty? Once again I am blown away of what nature offers us – a great deal! Preheat the oven 350 F. Prepare the Chia gel in a small bowl. Stir for 1 minute, set aside. In a large bowl mix the dry ingredients. Combine the chia gel with the coconut milk and the oil. Add it to the dry mixture. Stir the dough and knead it with your hands. It should not be too runny. Put the dough into a round form and bake for 25-30 minutes. Meanwhile make the cream with a food processor or hand blender. Let it it sit in the fridge until the cake is ready. 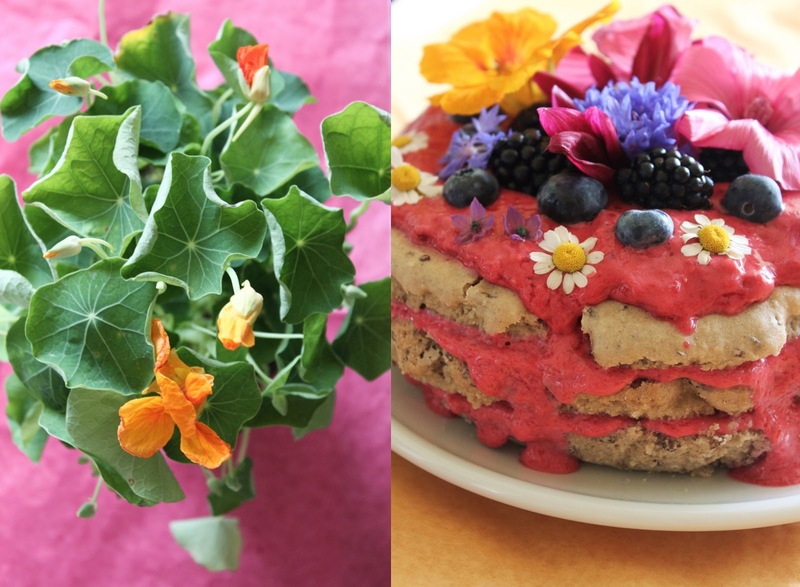 Pick some edible flowers or buy them in a store. Let the cake cool down, cut it carefully into three pieces. Begin with the cake, spread the cream on top and follow with the second and thir layer. 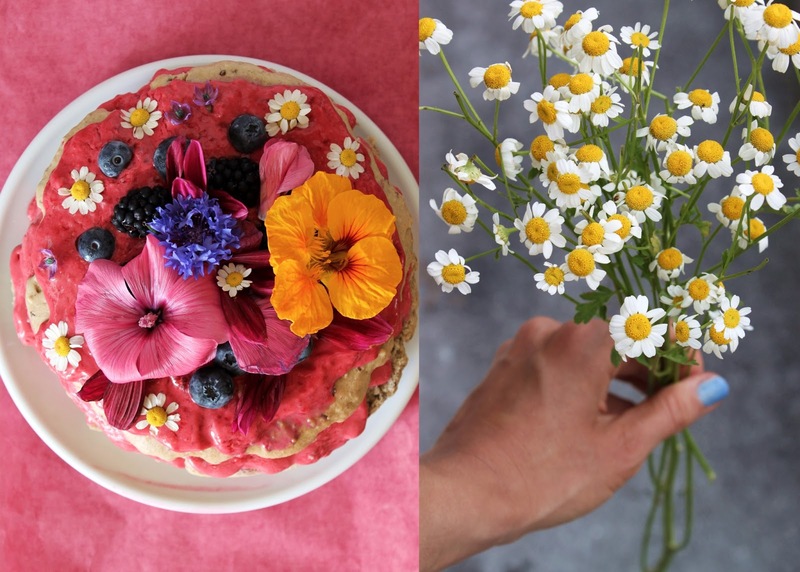 Take some berries and flowers for the topping. Let’s try to be more grateful for what we are able to enjoy, share and have free access to! Are you aware of what the world is offering you? All the year round? Tell me at least three things you are grateful for in the comments. Or meet me here! As I said before – I am jumping for joy to meet and connect with you!